Dear EarthTalk: I've heard that the chemicals we use to unclog backed-up drains are harmful to our health and the environment. Can you suggest safer alternative products or methods? Chemical drain clog removers do contain some pretty harmful stuff. The three main types available to consumers--caustic, oxidizing and acid--work by using harsh chemicals that heat up clogs to melt the congealed grease impeding the outflow. All three are acutely toxic to humans and animals if swallowed and coming into contact with them can burn your eyes, skin and mucous membranes. Even the fumes can cause respiratory distress. These chemicals can also explode inside your home's pipes--especially if inadvertently mixed with other chemicals or cleaners. Unfortunately, you'll have to look hard to find drain clog removal formulations that don't come with big risks. The Environmental Working Group (EWG) Guide to Healthy Cleaning gives drain clog removers from the likes of Amway, Clorox, CVS, Drano, Liquid Plumr and Safeway an "F" grade, given their toxicity to humans and animals and harshness to the environment. And don't be fooled by a product's branding, as an eco-friendly name can sometimes belie toxic ingredients. To wit, EWG also gave an "F" to Up and Up Drain Pipe Opener and Earthworm Family-Safe Drain Cleaner for their environmental and health dangers. EWG found that a few products--Biokleen Bac-Out Drain Care Gel, Drainbo The Natural Solution Natural Drain Cleaner and Earth Friendly Products' Earth Enzymes Drain Opener--did a decent job unclogging drains without using especially toxic chemicals, but it's always better to try to avoid the problem in the first place. In the kitchen, refrain from putting eggshells, coffee grounds, pasta, potato peels, rice, flour, produce stickers, paint and cleaning products down your sink drain, even if you have a garbage disposal. As for keeping grease out of the drain, try to scrape or mop it up with a paper towel and throw it away. Also, keeping your garbage disposal clean--pour a little dish detergent down the drain and run the disposal under cold water for a minute or two each night after doing the dishes--will also prevent back-ups. As for the bathroom sink, shower or tub, hair--whether from dad's shaving or sister's styling--is likely the chief suspect in clogs. A hair catcher like the TubShroom (or SinkShroom or ShowerShroom) could help. This ingenious little mushroom-shaped device pops into the drain and attracts and coils hairs around itself before problems start. Pop it out every couple of weeks, peel off and dispose of the collected hair in the garbage, and start the process all over again. A little preventive maintenance goes a long way to keep drains clear. Health and wellness site Mercola.com suggests filling sinks with a mix of white vinegar and warm water, then releasing the drain so this all-natural dynamic cleaning duo can do its work degreasing your outflow pipes. If the drain still runs slowly, pour in several tablespoons of baking soda followed by a white vinegar chaser. 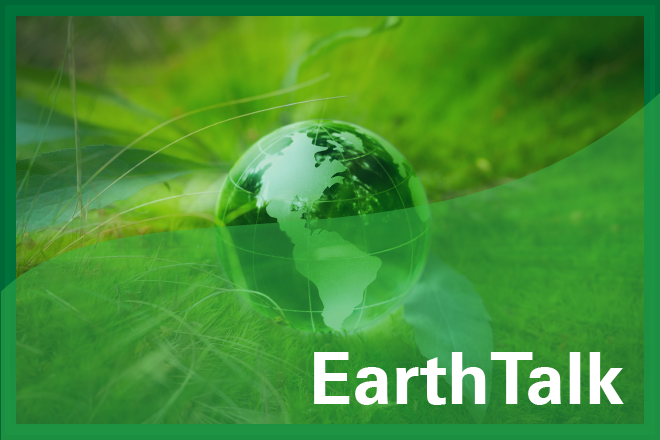 EarthTalk(r) is a weekly syndicated column produced by the non-profit EarthTalk. To find out more, submit a question, or make a donation, visit us at EarthTalk.org. EarthTalk – what is the so-called Green New Deal? EarthTalk – What is the theme for this year’s Earth Day?